The Sing Along Star Microphone makes singing fantastic fun. Your child can hear their voice amplified, enjoy backing music and also see cool lights flash as they sing to their heart's content. At the end of the show, the pink Sing Along Star Microphone adds clapping and cheering. Your child can use the microphone's extending stand to sing along while playing an instrument with their hands, or making extravagant hand actions. They can also take the Sing Along Star Microphone off the stand to dance while they sing. 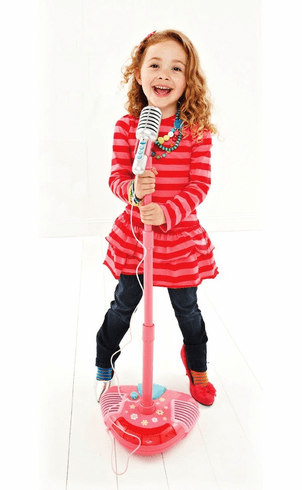 The microphone has an adjustable, pink stand, flashing lights, and cool sounds to wow your future rock star. Features include: pedals with sound effects, flashing lights, cheering sounds, clapping sounds, and 4 rhythms. For ages 3 and up. Requires 4 C batteries (not included).